The Elms is one of the historic Newport Mansions hosting the 7th annual Newport Mansions Wine & Food Festival, September 21-23 in Newport, Rhode Island, featuring world-renowned celebrity chefs Emeril Lagasse and father-daughter duo Jacques and Claudine Pépin, as well as exclusive wines from around the world © 2012 Karen Rubin/news-photos-features.com. The Newport Mansions Wine & Food Festival celebrates its 7th year as the most sophisticated wine and food festival on the East Coast. The event returns September 21-23, featuring world-renowned celebrity chefs Emeril Lagasse and father-daughter duo Jacques and Claudine Pépin, as well as exclusive wines from around the world, and fabulous food from the region’s most-celebrated restaurants and caterers. Sponsored by FOOD & WINE, the Festival takes place in the historic Newport Mansions, Rosecliff, The Elms and Marble House in Newport, Rhode Island. The fun kicks off with the Wine & Rosecliff Gala, where guests will enjoy vintages uncorked exclusively for the evening alongside delicious food pairings. The activities continue throughout the weekend, with a 2-day Grand Tasting, informative seminars with some of the industry’s most respected personalities, auctions, and new this year, a Collectible Wine Dinner at The Elms. Tickets to the 7th annual Newport Mansions Wine & Food Festival, including the Grand Tasting on Saturday and Sunday, as well as all-inclusive weekend packages, are on sale now, and may be purchased at http://www.NewportMansionsWine andFood.org. Ticket packages are tailored to satisfy the interests of all guests, whether in town for the day or the weekend. Individual tickets are available for each event, but for those guests who want to enjoy more of the weekend, combination tickets are available. The Connoisseur’s Package includes Wine & Rosecliff admission and either the Saturday or Sunday Grand Tasting at Marble House. For those who want to experience everything that the Newport Mansions Wine & Food Festival has to offer, the Wine Lovers Weekend Package, new this year, provides admission to Wine & Rosecliff, one Grand Tasting day, the Collectible Wine Dinner, and three seminars. Wine seminars will be offered all three days of the Festival, offering entertainment and enlightenment for everyone from the curious new wine drinker to the most seasoned connoisseur. Seminar presenters will include Thirsty Girl’s Leslie Sbrocco, Master Sommelier Laura Maniec of New York City’s Corkbuzz Studio, Stuart and Suzanne Bryan of Pride Mountain Vineyards, and wine writer Jordan MacKay, among others. The Newport Mansions Wine & Food Festival is also sponsored by National Trust Insurance Services, Buitoni, Porsche of Warwick, United Airlines, Alex & Ani, Stella Artois, Dasani, Alaska Seafood, Clarke Luxury Showrooms, Dave’s Fresh Marketplace, Honest Tea, Vinho Verde & Wines of Portugal, Casa Cornoer and the Italian Trade Commission, Hyatt Regency Newport, Amtrak, Johnson & Wales University, Roseann Tully’s Intermezzo, Travelocity, New England Home and Yankee Magazine. 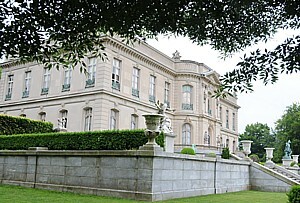 All proceeds from the Newport Mansions Wine & Food Festival benefit The Preservation Society of Newport County, a non-profit organization accredited by the American Association of Museums and dedicated to preserving and interpreting the area’s historic architecture, landscapes and decorative arts. Its’ 11 historic properties—seven of them National Historic Landmarks—span more than 250 years of American architectural and social development. For more information and to purchase tickets for the 2012 Newport Mansions Wine & Food Festival, visit www.NewportMansionsWineAndFood.org, or call 401-847-1000.